Smartcuts is a useful tool for thinking about problems differently. 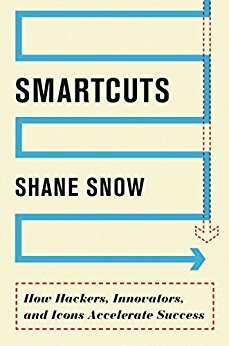 The most frequent path or obvious path is usually the worst, and if you can approach problems differently using some “smartcuts” you’ll typically do much better, or get to the goal much faster. New ideas emerge when you question the assumptions upon which a problem is based. Don’t assume your first interpretation of a problem is the right one. Major success in a field frequently happens by becoming strong in one area, then switching over to a new but related one. This gives the impression of “overnight success” without that actually being true. The common pattern among these fastest-rising US presidents’ journeys is that, like the BYU students, they didn’t parlay up a linear path. They climbed various ladders of success and then switched to the presidential ladder. The fact that our best presidents— and history’s other greatest overachievers— circumvented the system to get to the top speaks to what’s wrong with our conventional wisdom of paying dues and climbing the ladder. Hard work and luck are certainly ingredients of success, but they’re not the entire recipe. In fact, one-on-one mentoring in which an organization formally matched people proved to be nearly as worthless as a person having not been mentored at all. However, when students and mentors came together on their own and formed personal relationships, the mentored did significantly better, as measured by future income, tenure, number of promotions, job satisfaction, work stress, and self-esteem. In ancient Greece, few people had access to the best mentors. Jay-Z didn’t either, but he had books from which he could get an inkling about what those kinds of mentors were like. With every increase in communication, with every autobiography published, and every YouTube video of a superstar created, we increase our access to the great models in every category. This allows us to at least study the moves that make masters great— which is a start. The research showed that experts— people who were masters at a trade— vastly preferred negative feedback to positive. It spurred the most improvement. That was because criticism is generally more actionable than compliments. Crucially, experts tended to be able to turn off the part of their egos that took legitimate feedback personally when it came to their craft, and they were confident enough to parse helpful feedback from incorrect feedback. Meanwhile novices psyched themselves out. They needed encouragement and feared failure. (see Ego is the Enemy). How can you not repeat yourself, create systems to accelerate or supplement your knowledge? It’s better to know how to know than to know. Learn how to learn. Getting small wins helps keep pushing you along, and ensures success in the long run. Constant struggle with no small wins is not very helpful. Here’s a fact: Creativity comes easier within constraints. For example, what if I asked you to do the following exercise: Say something funny. Most of us freeze at such a broad challenge. Sure, there’s a lot of “freedom” in it, but somehow it’s tough to come up with something on the spot. Now, say I put a constraint on the exercise: Tell me a knock-knock joke. For most of us, this one’s much easier. There’s a formula to follow. You can probably think of a few right away. And if you’re coming up with a joke from scratch, the knock-knock is going to be significantly easier.